I am so excited to share that Emma asked me to stay on with her My Creative Time Design Team for another term! I had such a blast working with Emma and my teammates, and I absolutely adore her stamps. I am thrilled to continue! Thanks, Emma! 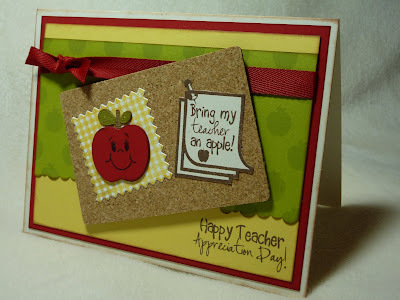 Today I am sharing a card made with two stamps from Emma's "My Teacher Rocks" set. This stamp set is perfect for Teacher Appreciation Week or any time you want to give a little something to your favorite teacher (we LOVE feeling appreciated, LOL). 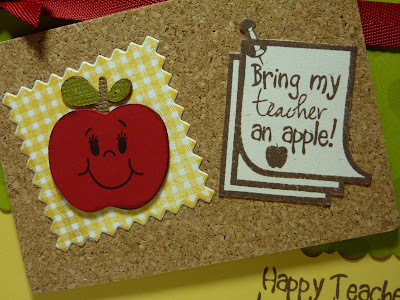 I just adore this little stamp with the note to bring an apple to the teacher! The cork paper that I ordered from Michelle Wooderson's Etsy Shop just arrived yesterday, and as soon as I got it in the mail, I decided I had to make a little bulletin board out of it to use with Emma's stamp! The cork paper is very soft and easily cuts with dies in the Cuttlebug. Because it is so soft, I adhered it to a piece of cardstock before popping it up. My little apple is cut at 1 1/4" from Create a Critter. Be sure to stop by My Creative Time to meet the new design team! Congrats!! I look forward to working with you on Emma's design team. I love your work and I'm so excited. I have already been a follower of your blog. Have a super weekend. Very cute card, and congrats on another term! You deserve it - your work is always amazing!! How lucky they are to continue to have you on their team! You card is perfect for Teacher Week. Very nice! Super adorable card! Congrats on being asked to stay on the team! I am really looking forward to being on the team. Great teacher card very cute. Hello Katie, love EVERYTHING about your teacher's card. Very very nice.